Two very different beers that seem like a strangely perfect pairing. 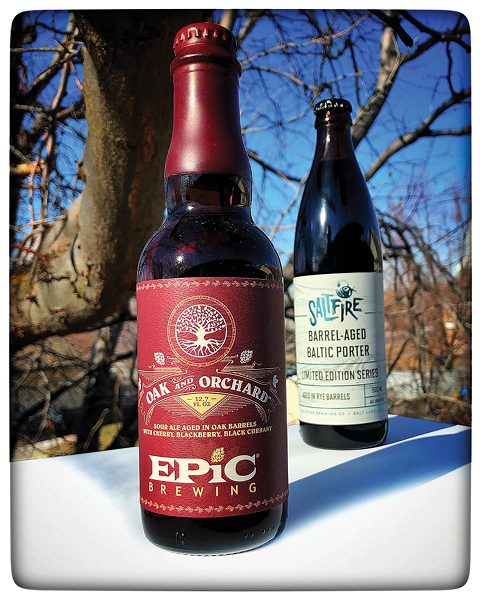 This week's beers were enjoyed weeks apart in different environments: Epic Brewing Co.'s beer was savored at its Salt Lake City brewery, and SaltFire Brewing Co.'s beer at home with my cocker spaniel, Henry. As I put together my notes on each, I couldn't help but think of the other. They were so different, but each beer made me crave the other like I was trapped in some kind of ouroboros allegory. They seemed like the perfect combo to present this week. Maybe you'll get the same ghostly yearning I did. Enjoy! SaltFire Barrel-Aged Baltic Porter: Baltic porters have a common past with IPAs in that they were both designed out of necessity—namely, they were made to survive long journeys in a time before refrigeration. The typical traits for baltics include high alcohol, smoke, roasted brown malts and bitter tastes to mask the wear of travel. This porter has the addition of American bourbon barrels for more depth, the result akin to a warm blanket. The beer looks nice enough—a deep brown, nearly black body with a little tan head that recedes to some soapy bubbles. The aroma is satisfying as well, as vanilla from the barrel makes a strong showing alongside caramel sweetness and a touch of chocolate. The bourbon is also there, adding just a note of heat. Once in the mouth, the bourbon shines and the barrel gives some more vanilla and wood notes, along with a touch of tannins. The base beer is nicely sweet, and the barrel adds to that. The flavors are rounded by a good dose of caramel and a touch of dark chocolate; coffee and dark fruit lead to the end. The mouthfeel is medium and smooth with creamy carbonation, but just a touch oily. Overall: A great example of what a bourbon barrel-aged baltic porter should be. It's light-handed on the booze, yet adds all the complexities of bourbon to the equation. It's worth grabbing a few extra for your cellar, for sure. Epic Oak and Orchard Cabernet Sauvignon: This cab sav barrel-aged sour was made with the addition of cherry, blackberry and black currants. The berries add a nice fuchsia hue to the beer that borders on ruby, with copper highlights and minimal spritzy head that dissipates to nothing. Balsamic vinegar, lactic acid, oak, vanilla, caramel sweetness and red wine must form the initial aroma, with a bit of rogue yeast funk. There's a definite wine character, with sharp fruit notes of cherry and dark berries. This one smells fabulous! The flavor is assertive and complex. The berries seem to come through more than the cab sav barrels at first, with an alcoholic sweetness and prominent liquor. The tart and sour combo from aging comes in next, picking up some of the barrel's influences—most notably vanilla, oak and vinious tannins. The finish is quite dry, with tart cherry and balsamic vinegar that light up the sides of the tongue. This beer runs the full scope of flavors. Decidedly sour and tart, the berries are assertive enough to hack through and strike a balance between fruit and wood. The 6.5 percent body is moderate and smooth, with minimal carbonation and a hint of alcohol warmth. Overall: Very complex. The malt and berry presence interacts brilliantly with cabernet sauvignon-soaked oak, and the yeast funkiness plays so well with the wine characteristics. A highly drinkable beer, yet puckeringly sour. Be warned: If you choose to go with these contrasting beers in a back-to-back session, the sweet-and-sour tug of war might leave your tongue in knots. Sounds fun, eh? As always, cheers!